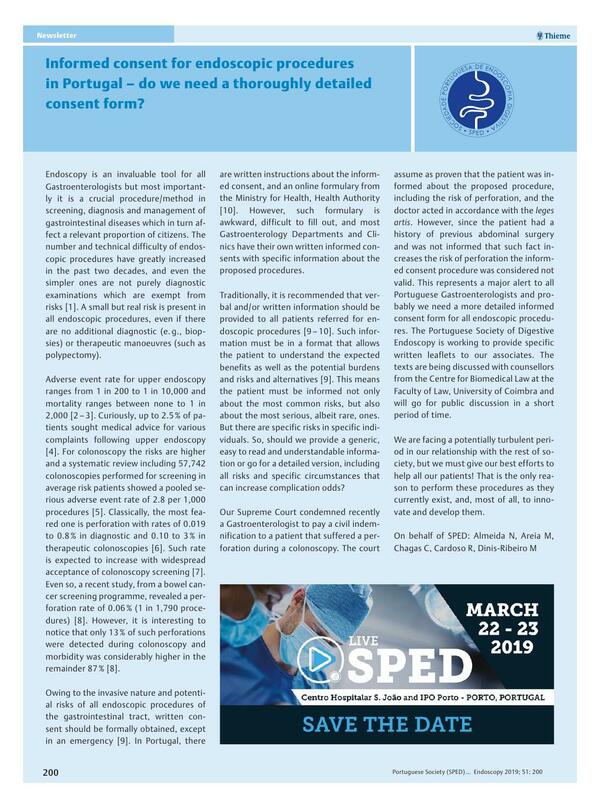 Informed consent for endoscopic procedures in Portugal – do we need a thoroughly detailed consent form? Endoscopy is an invaluable tool for all Gastroenterologists but most importantly it is a crucial procedure/method in screening, diagnosis and management of gastrointestinal diseases which in turn affect a relevant proportion of citizens. The number and technical difficulty of endoscopic procedures have greatly increased in the past two decades, and even the simpler ones are not purely diagnostic examinations which are exempt from risks . A small but real risk is present in all endoscopic procedures, even if there are no additional diagnostic (e. g., biopsies) or therapeutic manoeuvres (such as polypectomy). Adverse event rate for upper endoscopy ranges from 1 in 200 to 1 in 10,000 and mortality ranges between none to 1 in 2,000  . Curiously, up to 2.5 % of patients sought medical advice for various complaints following upper endoscopy . For colonoscopy the risks are higher and a systematic review including 57,742 colonoscopies performed for screening in average risk patients showed a pooled serious adverse event rate of 2.8 per 1,000 procedures . Classically, the most feared one is perforation with rates of 0.019 to 0.8 % in diagnostic and 0.10 to 3 % in therapeutic colonoscopies . Such rate is expected to increase with widespread acceptance of colonoscopy screening . Even so, a recent study, from a bowel cancer screening programme, revealed a perforation rate of 0.06 % (1 in 1,790 procedures) . However, it is interesting to notice that only 13 % of such perforations were detected during colonoscopy and morbidity was considerably higher in the remainder 87 % . Owing to the invasive nature and potential risks of all endoscopic procedures of the gastrointestinal tract, written consent should be formally obtained, except in an emergency . In Portugal, there are written instructions about the informed consent, and an online formulary from the Ministry for Health, Health Authority . However, such formulary is awkward, difficult to fill out, and most Gastroenterology Departments and Clinics have their own written informed consents with specific information about the proposed procedures. Traditionally, it is recommended that verbal and/or written information should be provided to all patients referred for endoscopic procedures  . Such information must be in a format that allows the patient to understand the expected benefits as well as the potential burdens and risks and alternatives . This means the patient must be informed not only about the most common risks, but also about the most serious, albeit rare, ones. But there are specific risks in specific individuals. So, should we provide a generic, easy to read and understandable information or go for a detailed version, including all risks and specific circumstances that can increase complication odds? Our Supreme Court condemned recently a Gastroenterologist to pay a civil indemnification to a patient that suffered a perforation during a colonoscopy. The court assume as proven that the patient was informed about the proposed procedure, including the risk of perforation, and the doctor acted in accordance with the leges artis. However, since the patient had a history of previous abdominal surgery and was not informed that such fact increases the risk of perforation the informed consent procedure was considered not valid. This represents a major alert to all Portuguese Gastroenterologists and probably we need a more detailed informed consent form for all endoscopic procedures. The Portuguese Society of Digestive Endoscopy is working to provide specific written leaflets to our associates. The texts are being discussed with counsellors from the Centre for Biomedical Law at the Faculty of Law, University of Coimbra and will go for public discussion in a short period of time. We are facing a potentially turbulent period in our relationship with the rest of society, but we must give our best efforts to help all our patients! That is the only reason to perform these procedures as they currently exist, and, most of all, to innovate and develop them.